Careers in Sport, Fitness, and Exercise is your guide to landing your dream job in one of today's most exciting, popular, and fastest-growing industries! 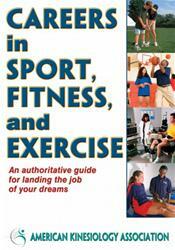 Produced by the American Kinesiology Association, this hands-on guide includes detailed job descriptions, information on working conditions, salary ranges, responsibilities, key skills, and required certifications for 36 careers in sport and fitness. ... If you are ready to pursue a job in the sport, fitness, or exercise industry, Careers in Sport, Fitness, and Exercise is one resource you can't be without.